The Shimano Moocher Plus 2000 GT is a very popular and effective reel for anglers who fish a Canterbury lure rod. 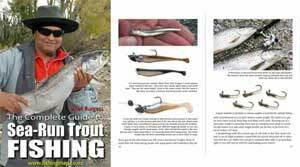 This salmon fishing methods is something of a cross between spinning and fly fishing. It employs a ten foot rod and large capacity fly reel, and uses monofilament instead of a conventional fly line. The target species are quinnat salmon weighing up to forty pounds and large searun brown trout both of which are caught in the lower reaches of the major South Island east coast rivers. This outfit comes into its own in the deep fast flowing channels at the river mouth. These channels are otherwise known as the gut. The Shimano Moocher 2000 GT will hold up to 340 yards of 20 pound monofilament line; though anglers using this method would typically fish heavier 50 or 60 pound mono because it is much softer on the hands. The reel weighs 448g (15.8 oz) and is well suited to balance the slightly heavier rods used in this type of lure fishing. Construction is of super tough graphite with a strong stainless steel reel foot. 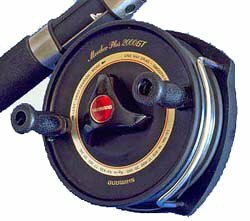 Salmon anglers frequently remove one of the reel handles when fishing a moocher reel as they find it easier to use with only one handle. 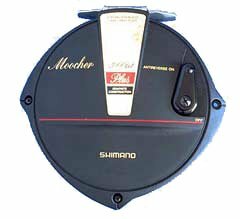 The Shimano Moocher Plus 2000 GT incorporates a unique mechanism which allows the drag system to cut out when the line is being retrieved. This smooth, low resistance reel feature allows the angler to fight the fish; not the drag. However, if line is being played out by a strong running fish, the drag system cuts in and the fish is then fighting against the infinitely adjustable ultra smooth, yet powerful drag system. To change from left to right hand use it is simply a matter of undoing a couple of screws and changing the position of the line guide. Then remove the anti-reverse ratchet and flip it over and reassemble.